The San Francisco company also launched a Web-based app that runs inside any browser, expanding Feedly's desktop presence from Apple's Safari, Google's Chrome and Mozilla's Firefox to also include Microsoft's Internet Explorer (IE) and Opera Software's Opera. "Feedly cloud is now live ... to seamlessly replace Google Reader," said Feedly in a Wednesday blog post. When Google announced it would kill off Google Reader on July 1, Feedly became the preferred destination for millions of refugees because it was the first to promise users it would craft a homegrown clone of the Google Reader API (application programming interface), code-named "Normandy," before Google's service went silent. Normandy officially went live today. "This is a landmark for Feedly, as we go from being purely a reader to becoming a platform," the company trumpeted. "Feedly Cloud is the foundation that makes us completely independent from Google Reader." Until today, the only access from within a desktop browser was through plug-ins and add-ons that Feedly had created for Chrome, Firefox and Safari. 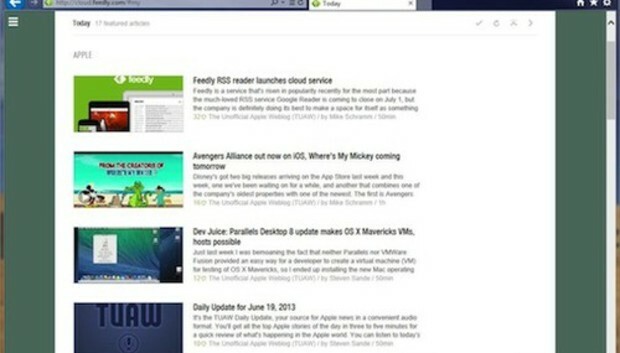 The Web-based app -- available at cloud.feedly.com -- eschews plug-ins and add-ons, opening up Feedly to IE, Opera and other browsers. Earlier this week, Feedly announced that it had started to move users from Google Reader's servers to its own infrastructure, a process that should wrap up by Friday. Today, Feedly also named the first nine third-party applications that rely on the Feedly API. While several had been identified before, new additions include Pure News Widget (for Android, $1.99) and Menere (Windows, free or $5.99). At the end of May, Feedly had 12 million users, a huge increase over its base prior to Google's decision to dump Reader. Those still using Google Reader can migrate to Feedly by heading to feedly.com and clicking on the "Import Your Google Reader" button. Feedly also offers free iOS and Android apps from the Apple App Store and Google Play, respectively. This article, Good riddance Google Reader: Feedly throws switch on alternate RSS service, was originally published at Computerworld.com.